How Do Security Patrol Teams Use Smartphones? The codeREADr app and web service empowers security patrol teams to capture, track, monitor, and report in ways that were previously impossible or impractical. Why? Because of the ready-availability of low-cost, feature-rich smartphones and tablets, along with enterprise employee tracking and security patrol app s like codeREADr. Security teams can use their own devices, or provisioned devices, to generate actionable data for real-time monitoring. This comes with detailed time- and location-stamped reports for management’s review. This not only increases the security team’s value in the eyes of management. Most importantly, codeREADr’s application as a patrol app can significantly improve facility and campus security. Based on feedback from our clients, here are the top five ways codeREADr is used as a security employee tracking and/or security patrol app. Following this list, read how one of the world’s largest security services, AlliedBarton Security, is using codeREADr. 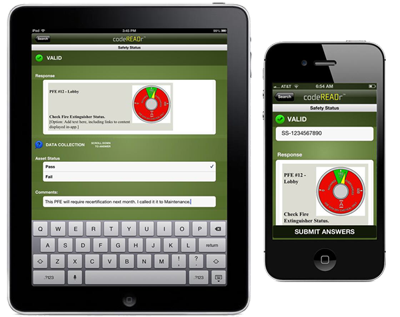 Businesses, factories, housing developments, and schools use codeREADr to monitor the status and condition of equipment and infrastructure. Reports are generated to confirm maintenance has been performed on schedule. They’re also used for meeting government regulations and building codes. A simpler application is for enforcing safety procedures. Facilities that already have access control systems in place instruct their current service providers to integrate with codeREADr using our extensive APIs. They get the best of both worlds – their provider’s purpose-built application plus codeREADr for mobility. Facilities without such systems use codeREADr as a simple visitor and employee tracking tool – basically a check-in and check-out function. This can be a fixed or mobile use. It is very similar to how codeREADr is used for attendance tracking. Facilities with parking management & control systems integrate codeREADr to add intelligent mobility and reporting. Facilities without such systems use codeREADr as a stand-alone tool. In managed lots, a typical deployment would include the creation of a database. This would include vehicle license plates associated to a specific employee, resident, or member. A QR code sticker could be issued to the vehicle owner for scanning with codeREADr. Or, the app user could simply use the app’s look-up feature to search for the vehicle by its license plate. Tracking security patrol performance based on time and location gives management the data to more effectively route and schedule coverage. This leads to better security. Guards scan a barcode tag at every door, gate, and lock to report its status in real-time. This way, there are records for highlighting problem areas and for reporting purposes. “We placed QR codes all over our campus that officers scan as they do their patrols. When they scan the QR codes we are able to track their movements and do monthly reports showing where they have been, what they have missed and where they are spending way too much time – we then try to balance their patrols. We put QR codes on our freezers and other highly important areas. After they scan them, the app shows them what the freezer temp should be, which helps in a major way because if the freezer is too high or low they can call it in right away. We can also give them directions to perform certain tasks at various points during their patrol, which is really helpful to them for doing their job. AlliedBarton is one of the largest security service companies in the world with 120 regional and district offices located across the United States. JC Chaudhry is one of the early adopters using codeREADr as a patrol app and, in my opinion, one of the most innovative. – Rich Sr.